Dollywood in Pigeon Forge, Tennessee now in 25th year. As always, the park offers nonstop family fun for all ages. New this year is Adventure Mountain. It's 2 acres of outdoor adventure featuring three obstacle courses. It's geared for adults and older children but youngsters can enjoy it too. Adventure Mountain even has a specially designed ground level area just for kids. It's high flying fun and adventure that lives up to its name. Don't worry though. The park has made sure that there are plenty of safety-harnesses and staff to help. Look in the gift shops for special glass bottles of Coca-Cola. These have Dolly's photo on the side. The six pack of bottles come in the traditional bright red Coca-Cola carrier. It's a unique gift or souvenir to take home from the Dollywood 25th Anniversary celebration. Not only are these great souvenir items but they can help you save money. The refillable mugs cost around $15 but can be refilled for much less. Signs throughout the park proclaim the special year. The best souvenirs are the ones of your family and friends. Take advantage of the many Dollywood 25th Anniversary banners and signs throughout the park. Stand next to one of them and have your photo made. The staff is more than happy to take your photo. 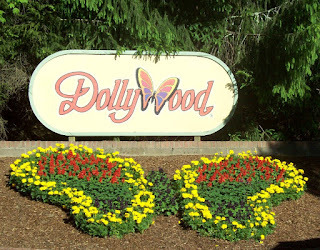 Let's not forget the special Dollywood 25th Anniversary stage shows and music events. These change by season so be sure to download the schedule online. The Silvertones have a daily musical performance that everyone will enjoy. There is at least one newer show that will leave you breathless. Sha-Kon-O-Hey has to be the best musical that I have seen anywhere at anytime. If you are going to the Dollywood 25th Anniversary you simply must see it. Like all shows at this park Sha-Kon-O-Hey is a family oriented tale of the Great Smoky Mountains.